Rachael Ray® 16-Pc. Nonstick Cookware Just $69.97! Was $300! PLUS FREE Shipping! You are here: Home / Great Deals / Rachael Ray® 16-Pc. Nonstick Cookware Just $69.97! Down From $300! PLUS FREE Shipping! Rachael Ray® 16-Pc. Nonstick Cookware Just $69.97! Down From $300! PLUS FREE Shipping! Rachael Ray® 16-Pc. Nonstick Cookware Just $69.97! Down From $300! You can get this Rachael Ray® 16-Pc. 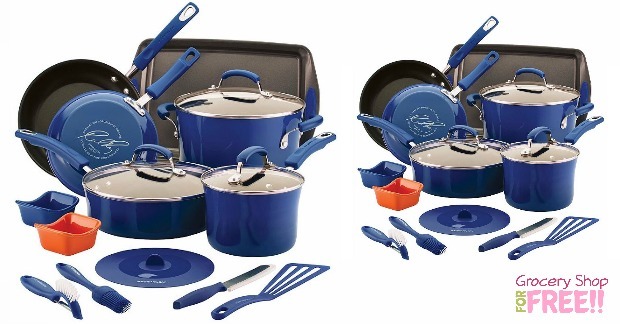 Blue Kitchen in a Box Nonstick Cookware Set for just $69.97!! Down from $300! What a nice set! I LOVE the color, too! Just use code: FREESHIP25 at checkout to get FREE shipping, too! Bring a pop of color to your kitchen with this “Kitchen in a Box” cookware set from Rachael Ray.